Mr Toad has the honor of jump starting this inaugural post. Welcome to my blog. Here you will discover I like to hop around from commercial art projects to fine art creations. My career takes me from custom hand lettering on signs, calligraphy on cards, gold leaf behind glass, interior and exterior murals, acrylic on canvas and watercolor painting. Is there a barrier between commercial and fine art? That is not a debate I want to begin. I may design a legible brand or logo identity with contrasting shapes and lines, or I create a painting not from what I see, but from what I think or feel. In each endeavor, I hope to find what ought to be. If I entertain and communicate, perhaps I succeeded. Maybe. Maybe not. I welcome your comments. There are no formalities here. Your honesty is my reward. 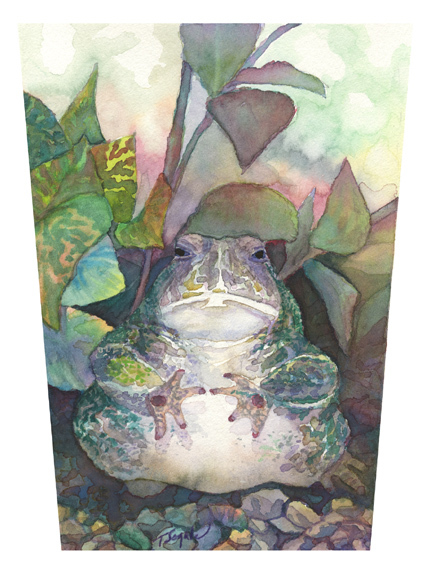 Mr Toad is a watercolor. He is a symbol of evolution. To me, he is also a symbol of freedom. Freedom to hop from project to painting, discovering which way his toad ride may take him. I invite you to hop along. You may see a watercolor painting, or a large mural, or hand lettering and/or a new watercolor. I’m past the point of no return now, waiting to pop out the other side.